Lexi Adsit is an organizer of the Queer Yo' Mind conference and leader of the SF State queer community. The Queer Yo' Mind Conference highlights intellectual scholarships and activism, and focuses on empowering queer communities. Photo by John Ornelas. Amiable chatter between friends gave way to tension when a small portion of SF State’s queer community met with two Associated Students, Inc. representatives to discuss the status of the Queer Resource Center. The Queer Resource Center was proposed last spring by ASI as a new safe space that would be accessible to all queer students on campus. Initially excited about the prospect of this new resource, some queer-identified students are now voicing their frustrations with the dragging process of hiring a director and getting this project off the ground. 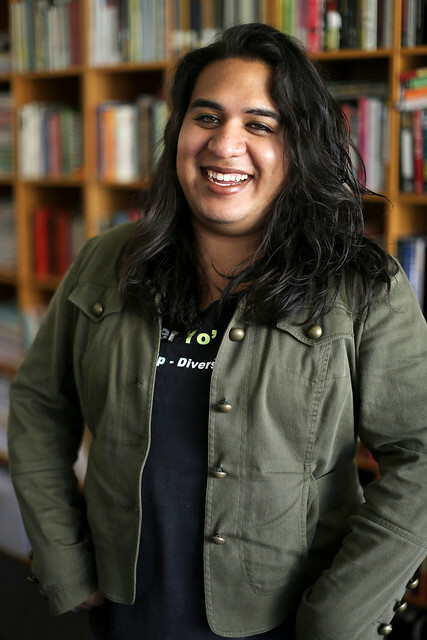 Adsit is a women and gender studies major, an organizer of the Queer Yo’ Mind conference and a recognized leader in SF State’s queer community. She was wary of the ASI’s proposal from the beginning. “There was an unveiling of the proposed Queer Resource Center, and there was a lot of community feedback about what it was missing and why parts of it were extremely problematic, and there were no conversations after,” Adsit said. Planned to begin as a part of EROS, SF State’s sexuality resource center, and to grow from there, students felt that the proposed QRC didn’t do enough to expand on resources that already existed. With such a diverse queer community, students wonder why there hasn’t been more diverse input in the planning process. ASI representatives Abel Gomez and Nazia Chandiwalla, who were both present at the meeting Sept. 13, insist they are and have been open to suggestions regarding the QRC. As a queer-identified student himself, Gomez said he felt compelled to join the ASI’s Board of Directors this year for the very purpose of lending a queer voice to the board. The ASI representatives say that because of Adsit’s leadership role in the community, she was invited to join the planning process, but chose not to. Adsit was planning the first Queer Yo’ Mind conference at the time and says that her unavailability doesn’t excuse the lack of diverse representation throughout the process. “This isn’t a project that should be left to only ‘leaders.’ It should also be something that nonleaders and other community members had a say in,” she said. The most starkly contrasting opinions between the concerned students and the ASI representatives have to do with transparency. But Anibal Hurtado, who acted as a moderator during the meeting, insisted there was no transparency and was not content with the suggestion that all was being done to inform the students. “(ASI doesn’t) know what they’re doing and they don’t know what an action looks like,” said Hurtado, a Cal State East Bay student, and friend to Adsit and other students who were present. Though the students have already grown restless, ASI has asked for patience. There are still concerns about the diversity of representation in the project and about the hiring process, which is to resume this week. Adsit has scheduled a second meeting for Sept. 20 at 10 a.m. in HSS 378.